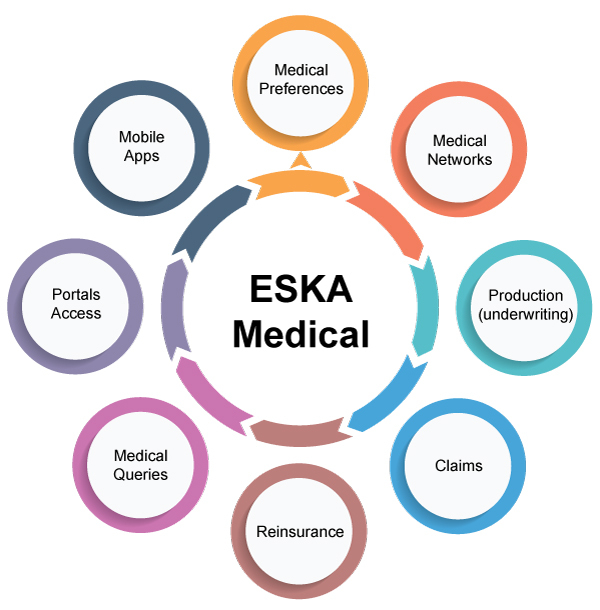 ESKA Medical an inventive Medical Insurance Management System to ease and facilitate operations. ESKA® Medical is our health insurance management system, as part of our insurance management suite, ESKA® Insures. This comprehensive system functions to speed up and simplify your medical insurance process from start to end. With features such as data recording, handling of production, medical networks, claims, renewals and more, ESKA Medical covers all your essential medical claims process. 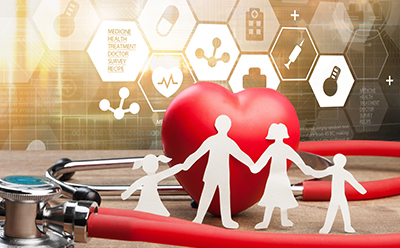 Catering to all parties involved within the health insurance sector, this handy system supports companies, insurance company employees and insurance holders. Transform your claims processing into an easy and direct flow. ESKA Medical covers all your essential insurance needs and services. From processing claims to handling reinsurance processes, this do-it-all system can cater to all your health insurance needs. By creating a direct and easy-to-use workflow, you can easily have your needs taken care of. With simple functionalities and features to utilize, you can have all your tasks completed in no time. Pick and choose the features you see fit based on your specific company rules. With a fully customizable system, you can choose your preferences or add any additional functionalities that you see fit. Keeping all data stored and recorded in a hierarchal manner will make data entry tasks so much easier. Why not keep your insurance information fully organized with a greatly structured division. 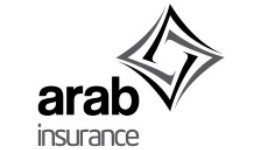 Creating a safe and secure environment ready for you to conduct all your health insurance activities. This system provides high level security for every phase of your health insurance process. By providing fully automated results in an easy-to-read format, all your insurance reports can be easily accessed and organized. Have all your reports ready for you, ready to be printed in various formats, such as Word, Excel and PDF. ESKA Medical follows all standards and regulations from both the medical and insurance industry. Following ICD-9, ICD-10 and CPT codes, as well as other rules made for your claims processing and third party integrations. By connecting with other third parties, such as government institutions, medical networks and third party APIs, ESKA Medical can help you complete a full medical insurance cycle. Customize your insurance preferences, from medical services and underwriting tasks to claims and finances. Web access for members, providers & policyholders. Support ICD-9, ICD-10, & CPT codes. Multiple medical networks with related price lists. Automatically store claims’ information for reimbursement. Claim auditing engine with over 120 defined rules. Compliance with various governmental regulations. Third Party Administrators (TPA), Capitation business (HMO). Manage all your medical providers through a digitalized medical database. Conduct underwriting tasks through an automated and predefined process. Handle reinsurance through a direct and digital process. Provide a comprehensive report with a user-friendly dashboard/template.